You are currently browsing the The Pet Product Guru blog archives for the day Saturday, May 19th, 2018. I’m sure you’ve heard your cat hiss and have seen him puff up his tail. This means that he feels threatened. If you watch closely, when your cat gets startled, the pupils of his eyes will quickly become smaller. 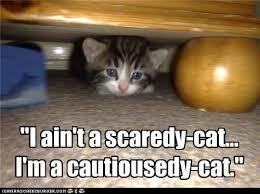 Your cat may show several different signs that he is frightened. He may also run, hide, growl and arch his back. To help reduce your cat’s anxiety, it is much better to slowly introduce anything that is new or different such as new cat toy, object, person and even another animal. Slowly, over time he will become used to the new addition to his environment. If your cat runs off and hides because he his frightened, don’t run after him and try to pull him out from under the sofa or bed. You’ll just make things worse. Be patient and let him come out when he is ready. My Cat Millie will always hide when we have company. She doesn’t come out until the company has left and all is quiet again. A rain weekend here on Delmarva — enjoy great oldies on our great oldies station —Edgewater Gold Radio. You may download the free Edgewater Gold Radio app or listen from our website: Edgewatergoldradio.com.